One of my favourite baby-bonding activities is bathing Fifi. She absolutely loves the bath - as long as it is very warm. I've learned how warm she likes it judging by how fussy she gets. We followed the hospital's advice for her first at-home bath, making the water body temperature, and let me tell you, girlfriend was not pleased with the chill. So next time we made it a bit warmer and a bit warmer until we've discovered she really likes a nice warm bath, just like her mummy (though she's not allowed to have it as hot as mummy likes it just yet). Today she lounged in her bath chair for at least ten minutes, if not more, before my knees started hurting and I really needed to take her out. She would've happily stayed even longer if I'd let her. This is a really good thing since I want to take her to the swimming pools as soon as I am allowed to get back in the water. Tomorrow, Mom and I going to take a disc of digital photos down to Tesco to get them printed, as we still haven't located the missing cord to our printer, and I want to start filling up her photo album and record book. 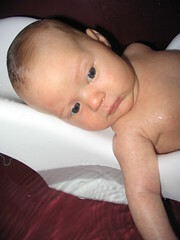 I'm glad she was being so good for so long, as it enabled me to get several shots of her in her bath. These are important photographs; these are the ones we'll use to embarrass her in front of her boyfriends.